Well here we go again another day and another match to have a go at , today we was off to Partridge lakes to contest the open and what better way to come out of my recent match fishing slump than fishing against a lot of good anglers and the odd big name . Arrived at the venue at 815 which as you know me was pretty late to get their because im usually the first , after paying the twenty pounds pools i noticed that over 60 were going to be contesting the match today and when we got to the burger bar they were doing extremely well keeping up with the demand as their was also the winter league that Leigh tackle had organized taking place today . At the draw i pulled out peg 51 which was on covey three and i wasn’t sure if this was a good peg or not because i hadn’t been for over six months , the weather today was quite warm for the time of year which was a mighty seven degrees and it was over cast with drizzle in the air , not bad conditions for a day’s fishing but on the down side it was flat calm which could make it a lot harder . 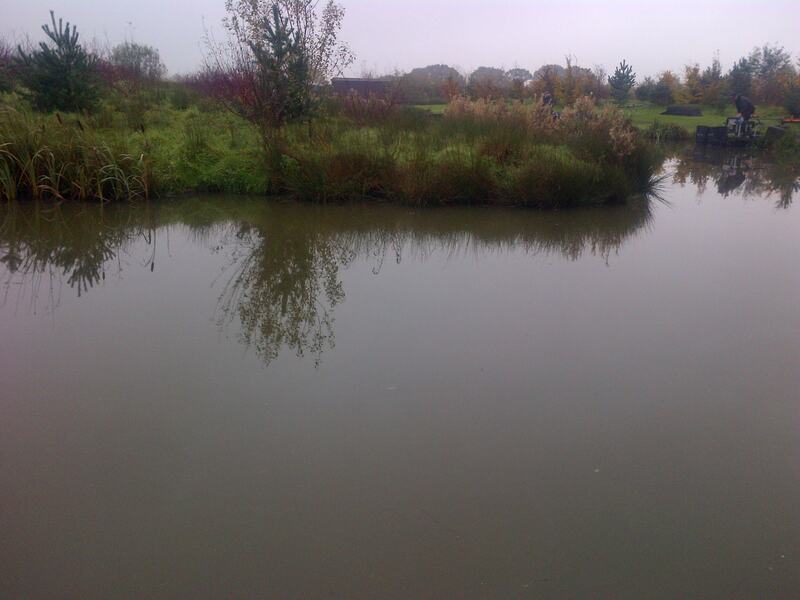 When i got to my peg it looked ok with a point of an island and an empty peg to my right , the odd fish topped in the channel too which was always a good sign . Although i did over hear a few people saying we was in the suicide section but it looked fishy to me and i couldn’t do anything about it now , so i would just take it easy with the feeding and feel my way into the peg . Margin + far bank , i plumbed up to find 1 1/2 foot and used a 0.3 matrix float with a spread bulk , my main line was 0.12 garbo attached to a size 18 gamma pellet hook , i decided to step up my elastic on this line to 13 hollo because carp could be present along the far bank and hopefully i would be bagging in the last hour in the margin. 3ft line at 8 meter along the far shelf , i used a 4×12 malmam winter wire with a spread bulk starting above the six-inch 0.10 garbo hook length attached to a size 20 gamma pellet hook . My main line was 0.12 garbo and elastic my usual orange matrix .This turned out to be my only rig that i caught f1s on and in hind sight i should have found that depth on my top four because that is obviously where the fish was more confident . 5ft channel line at six meters , i used a 4×16 malmams winter wire with a spread bulk above the six-inch 0.10 garbo hook length attached to a size 20 gamma pellet hook , my main line was 0.12 garbo and i didn’t use this rig on the day but yet again in hind sight it could have got me the few extra fish i needed to frame today . 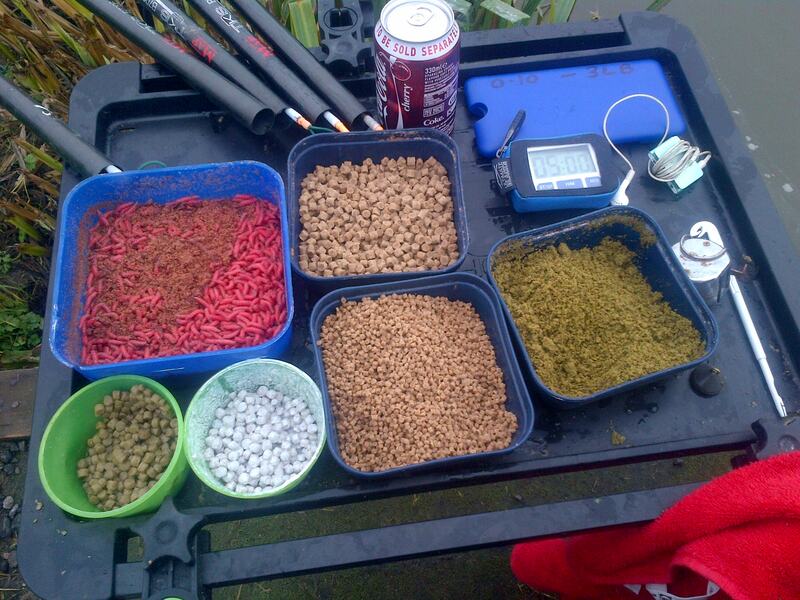 But i decided on a change of ground-bait from crushed expander to a dark green fish meal one , not sure if it made much difference but it didn’t do any harm so will be trying it again on here . As the all in sounded i went out to my eight meter line and tapped in some micro and ground bait with a normal expander on the hook , surprisingly i was soon into a 1 lb f1 which gave the slightest of sign on the float and next drop i missed a bite , which to my surprise killed the swim !!!! I persevered for a further thirty minutes on this line taping in a few pellets and lifting-dropping my hook bait but not even another indication , so a change was in order and i re-plumbed a new swim one meter to my right towards the open water . Here i planned on using just maggots to see if this would make any difference because you know how finicky f1s can be at times and this seemed to do the trick with four f1s coming in the next thirty minutes, yet again my swim died and i had been careful not to over feed , so i was puzzled as to the reason ? I noticed that those anglers to my left where also struggling like me , but the guy to the right who was on the first peg after the bridge was catching the odd fish tight across , so i decided to follow suit using maggot because that seemed the bait the fish wanted today and i worked all along the far bank with only one ide to show for it and you could say things wasn’t going well . 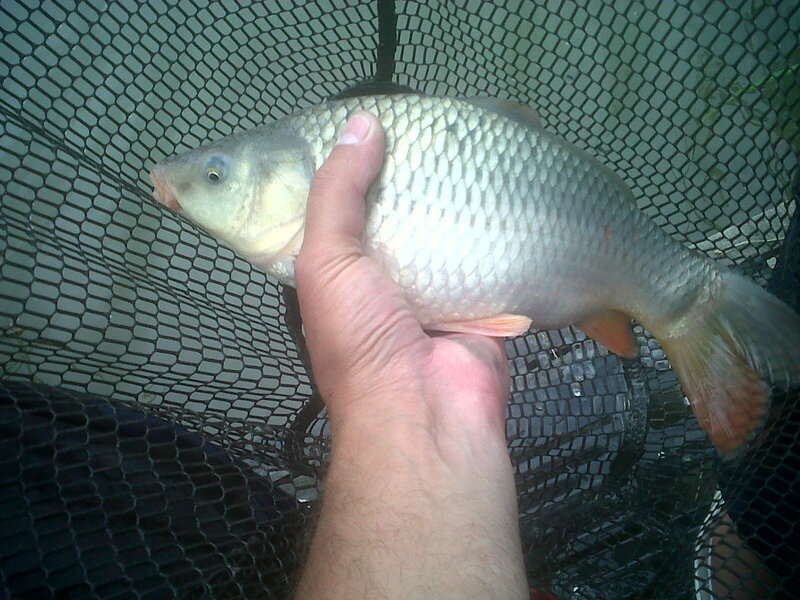 I had been loose feeding maggots to my left hand margin since the start of the match , so a quick try their resulted in nothing not even a liner !!! Another look on my eight meter swim produced a few f1s but they was only coming every twenty minutes and if you missed a bite that was that for a while , three hours in and i had only 12 fish in the net Not good ! ! worse was to follow when i had a run of six bumped fish , some was my fault because i tried to rush them in and some i think was foul hooked . Although when i put on a new hook it seemed to solve the problem but im afraid the damage may have already been done . In the last hour the wind got up a bit , blowing towards my bank and this also coincided with my best spell of the match with me catching six f1s , topped off with a near 3 lb one but it was really hard work and i had to keep changing hook baits , depths etc to keep the bites coming . As the all out sounded i was unsure just how i had done and i knew that i had beat the two anglers to my left but couldn’t see the others round the corner , my 18 fish went 28lb which as you can tell are a good stamp and luckily i had managed to win my section but that spell of lost fish probably cost me from framing which is very hard to do on here with the quality of angler your competing against . 36lb was last in the money . A hard but enjoyable match today and one which i think that i learned a lot , just may be my match fishing had turned for the better Fingers crossed . Off to Blundells on Sunday for the next round of my Autumn- winter league and we have 26 fishing which is a good turn out so just hope the weather isn’t too bad . This entry was posted in covey three, PARTRIDGE LAKES COVEY, PARTRIDGE LAKES OPEN MATCH. Bookmark the permalink. Yeah but its not often you get a chance to frame at partridge , especially when i only needed another 6lb . But that’s how it goes some times , cant wait to get back their now .